Solar Web Page > Categories > DIY Solar Experimentation & Performance > ALUMINUM AND POOL CHEMICALS DO NOT MIX! As you can see it's heavily corroded FROM THE INSIDE. There is NO flow through the HEX and when I applied pressure there were multiple pinhole leaks. As I have another ARETHA under construction I'm going to scrap this one, rather than try to repair it. No I'm not knocking the ARETHA concept, just noting that an aluminum HEX doesn't last when pumping pool water through it. The new one will have a CPVC HEX in the hot tub so that the the aluminum won't be exposed to the chemicals. Can you take a closer pic? it almost looks like hail damage. Is the water really hard as the photo looks really bad. No it's not hail damage, it's corrosion. The HEX is (was) built into the collector and protected from the elements (except heat). I would guess it's aluminum chloride, from the aluminum HEX and the chlorine in the tub. 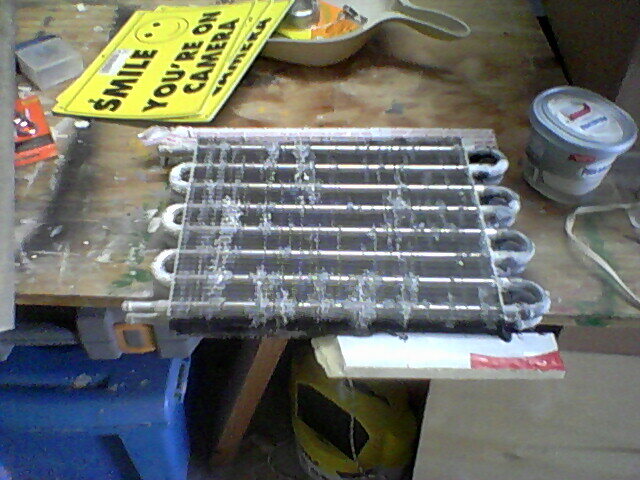 This HEX is NOT a radiator, but an oil cooler I had laying in the shop. Might be a different alloy from a regular aluminum radiator. Here's a pic taken just now with a better camera. Not the corrosion on the loops to the left.